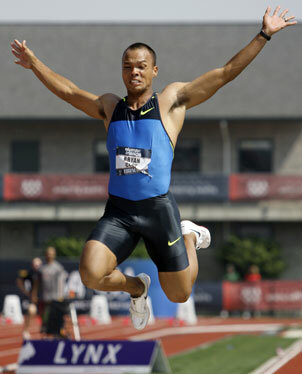 Castle's Bryan Clay represents the United States' best hope for gold in the decathlon since Dan O'Brien in 1992. The greatest athlete in the world. That's what the gold in the Olympic decathlon represents. It may not have the glamour that it once had, the prized photo on the Wheaties box, the "wonder boy" accolades bestowed upon Bob Mathias in 1948 and '52. It certainly is not the stuff of legends so thoughtfully chronicled in David Maraniss' recent book "Rome 1960: The Olympics That Changed The World" with the epic battle between UCLA teammates Rafer Johnson and C.K. Yang. Nor is it the much-hyped, ill-fated "Dan and Dave" commercials of 1992, where Dan O'Brien and Dave Johnson brought attention to the 10-event sport courtesy of Reebok. The American public would be hard-pressed to identify all of the 10 athletes featured in last month's "Got Milk?" ad in Sports Illustrated. Yet there, standing tall right behind former University of Hawaii soccer player Natasha Kai, is Castle High graduate Bryan Clay. The unassuming, milk-mustached, all-of-5-feet-and-11-inches Clay. America's best hope for the gold since O'Brien in 1996. » Career highlights: Gold medal at 2008 World Indoor Championship in the heptathlon, with a P.R. of 6,371 points, missing out on a world record by 10 seconds. ... Silver medalist in Athens (2004). ... Won gold at the 2005 World Championship and was ranked No. 1 in the world. ... Finished second to Tom Pappas at the 2003 and 2004 U.S. Outdoor Championships, then defeated Pappas to win the event at the 2004 U.S. Olympic Trials. 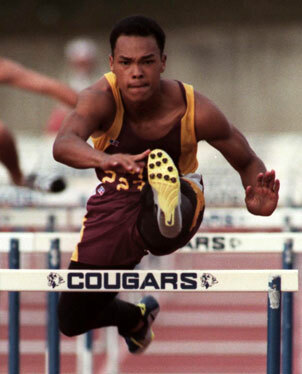 ... A record 23-time NAIA All-American at Azusa Pacific, led the Cougars to national indoor and outdoor championships as a senior in 2002, the first time that team double had ever been accomplished. » Fun facts: Clay scored 8,832 points earlier this month to break the previous Olympic Trials record of 8,726 set by Dan O'Brien in 1996, the year O'Brien won Olympic gold. Clay's score was a personal best, the best by an American in 16 years, and the best in the world in four years. » Tomorrow: Natasha Kai, soccer. Clay's thoughts last week, as training near his California home tapered off, were of both Beijing and Hawaii. The world will be watching later this month, the two-day competition at National Stadium: 100-meter dash, long jump, shot put, high jump and 400-meter dash on Aug. 21, 110-meter hurdles, discus, pole vault, javelin and the grueling 1,500 on Aug. 22. Can he deliver? Can he surpass his record-setting 8,832 points of June's U.S. Olympic Trials? "I've done everything I can do to be in the position to do well," said Clay, the silver medalist at the 2004 Games in Athens. "I hate thinking that I have to win the gold to show people what I'm capable of. I would like to think I've already shown it. "The way I look at it, the gold would be icing on the cake. I hope it goes well enough for me to come home with the gold medal. And hopefully there will be opportunities I can capitalize on to keep on training and competing." It's not that the 28-year-old Clay is playing what he calls "the poor card." But he acknowledges that his sponsorship money is nowhere near that of some of the higher-profile athletes in track, and certainly not those on Team USA Basketball. Clay, who moved to Hawaii from Texas at age 3, had a simple request from what he considers his home state: Join his fan club on Facebook.com, MySpace.com or BryanClay.com. "It's sort of a grassroots thing," Clay said. "If any place can do it, Hawaii can. You saw it with (American Idol singer) Jasmine Trias. "I'd like to have the biggest fan club of any Olympian. Not only would it help with my career, to be able to walk into a sponsor and say, 'I've got a million-plus people who'd watch me on something like Dancing with the Stars,' but it also would help the efforts of my foundation. We could reach even more people." 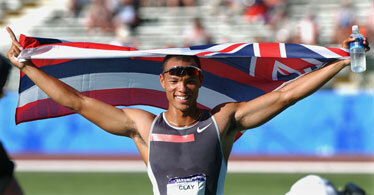 Bryan Clay has always been proud to represent Hawaii. After winning the Olympic Trials in 2004, he pulled out a Hawaii flag during a victory celebration. The Bryan Clay Foundation was created to help underprivileged Hawaii high school students with opportunities to further their education. Clay, a troubled youth who found a positive outlet through sports, continues to give back through athletic and academic scholarships and promotion of college education. "Growing up in Hawaii you can really forget there's more out there," he said. "Growing up there, you don't realize how big the world is. In my mind, only Hawaii mattered. "It's tough to leave the comfort. At some point, it changed for me. I now see it as a huge world of opportunity." Clay is living proof of where college can take an athlete. His storied career at Azusa Pacific included a record 23 NAIA All-American certificates and national indoor and outdoor track titles with the Cougars. He's had continued success on the national and international scene, winning silver (2004) and gold (2008) in the heptathlon at the World Indoor Championship. To many, Clay was ahead of schedule when upsetting Tom Pappas at the 2004 U.S. Olympic Trials to earn a trip to Athens and a silver medal at age 24. The schedule's been just fine, said Clay's coach Kevin Reid, head track coach at Azusa Pacific. "He had the raw tools, it just took a while to get all 10 events down," Reid said. "You could tell from the beginning he would be a great thrower. He knows how to compete. "The key with Bryan is, if he's healthy, he's real difficult to beat. His work ethic is tremendous, but it's more than that. He puts in the time and effort to learn. He's become a student of his sport." Clay competed in the 110-hurdles at the OIA track meet. At 5-11, Clay is considered small by decathlon standards. His biggest competition is expected to come from defending Olympic gold medalist Roman Sebrle (6-1) of the Czech Republic and Jamaica's Maurice Smith (6-3). "His strides aren't as long, but Bryan has become so adept at the technical aspects of his events," Reid said. "The key to the decathlon is consistency. His second day in Eugene (Ore., site of the June U.S. Olympic Trials) he was very solid. He struggled the first day then he comes out with the trials records and a P.R. "I think he's peaking at the right time. If he has the desire to keep on going (past 2008), he has the ability to do that." The goal has been Olympic gold. "It's possible," said Reid, who travels with Clay to Beijing on Tuesday. "It's the Olympics. Someone will always step up. Bryan will be ready to answer all challenges." That includes the much debated air quality in Beijing. "I've been through all kinds of conditions; look where I train now," he said of Southern California. "Athens was bad. Carson (Calif.) was smoggy and 120 degrees on the track. Helsinki was 50 degrees and raining sideways. "People have to remember that everyone will be competing in the same conditions. All I'm concerned about is that it's fair and equal for everyone. "My goal is to be first in every event if that's possible. If all goes well, I'll have the world record. I'm going to do whatever I can do to come home with the gold medal and not let anyone out-compete me." Clay is proud that he's able to showcase his talents as an athlete from Hawaii. "That's been my whole stance since I started doing well," he said. "I want people to know that we've got really, really good talent for such a small place. "Part of the Olympic experience is being able to march in behind your country's flag. There is so much pride in being able to represent the U.S. as well as Hawaii." Clay's competition can be followed live online on his Web site BryanClay.com. For more information on his foundation or sponsorship, contact sbienko@doylemanagement.com.